 A rambling oral history pasted together from interviews with a rambling philologist and professor of Jewish studies. The subject, Shlomo Noble, is born into a Hasidic family in Galicia in Eastern Europe. He slaps together an education in a traditional cheder for infants, and later at a backward grammar school in (Joe Namath's) Beaver Falls, Penn., a talmudic academy in New York, and, as his flirtation with Western culture grows, at Johns Hopkins and other universities in the Midwest, New York, and Germany. This dizzying itinerary offers many interesting glimpses into the Yiddishist's ``lifelong work of creative resistance and integration'' of foreign languages and cultures. With nostalgia filling in for the lack of drama, the narrative's high points are the snippets of linguistic humor, as when Noble's father is taught English by a greenhorn (``van, tshoo, three'') or when Noble mistakes a Swedish Bergquist for a Berkowitz. If the subject's ethnic identification is too central here, it is because the interviewer is an ethnographer who studied under Noble at the YIVO Institute for Jewish Research. 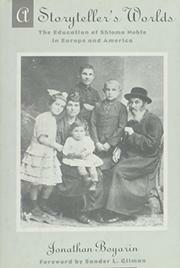 Boyarin is at his best when demonstrating the widespread cultural displacement that followed WW I, but his chapter commentaries tend to explain the obvious or to refer to obscure scholarly studies. When Noble arrives in the US near Thanksgiving, Boyarin beams that this ``places his immigration within the mythic space of the Pilgrims' voyage to America.'' An overanalyzed, underdeveloped exercise in biography whose several significant contributions would have made a fine article in an academic journal.